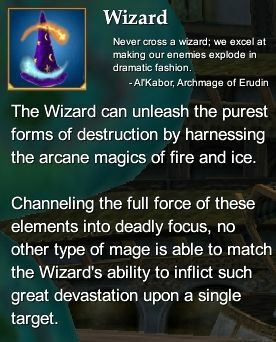 The Wizard profession is ideal for those who seek to unleash the purest forms of destruction through the arcane magic of fire and ice. Wielding these powerful elemental energies, the Wizard serves her party by devastating opponents from afar with damaging magic. The primary stat of the Wizard is Intelligence, to increase spell damage. The Wizard may use only cloth armor. Weapons wielded include daggers, staffs, and symbols. Only symbols may be used in the shield slot. Adept III spells are crafted by a Sage using the rare soft metal mined from stone. Wizard Epic Weapon Series (80) - Rise of Kunark Wizard Epic Weapon. This page last modified 2011-08-25 22:54:11.